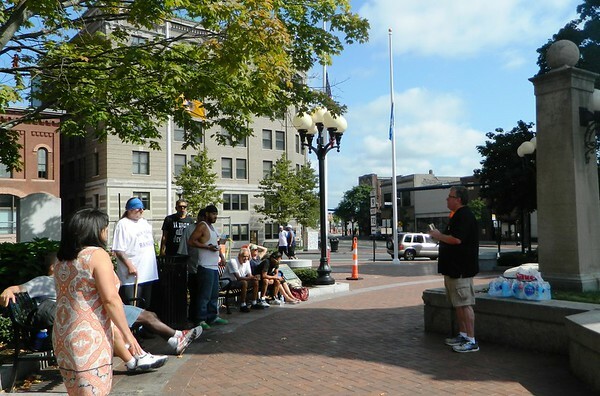 NEW BRITAIN - As local families sat inside air-conditioned churches throughout the city Sunday morning, a small group stood in a circle downtown, breathing in the summer air and Bible passages beneath a blue sky. Most wore street clothes and lugged several personal carry-alls, fearing they’d be stolen from whatever piece of ground shared their sleep hours before. Tom and Donna Baran had slept comfortably in their home in Southington, but chose to spend the morning in Central Park with this group, most of whom are homeless. 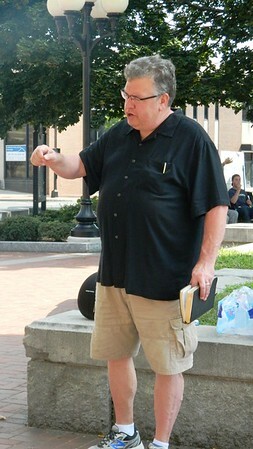 Some people sat on benches, others stood around the park’s stone monument, listening to Tom share God’s word. They filtered in and out as Donna hugged regular attendees and passed out water bottles. The Barans are the Isaiah 61 Ministry. He is lead pastor and she, ministry coordinator. 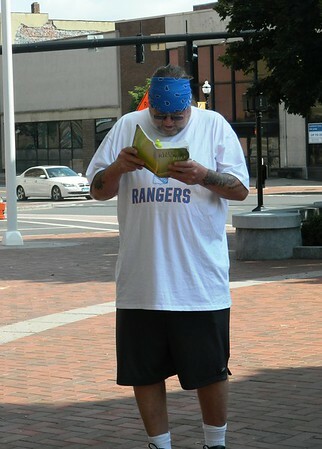 Self-described born-again Christian Dan Imbimbo stepped up to his side, reading aloud from the Bible first, sharing his own message second. Imbimbo sleeps and eats at the St. Vincent de Paul Mission shelter in Bristol. Every Sunday morning, the Barans pick him up before heading to New Britain. 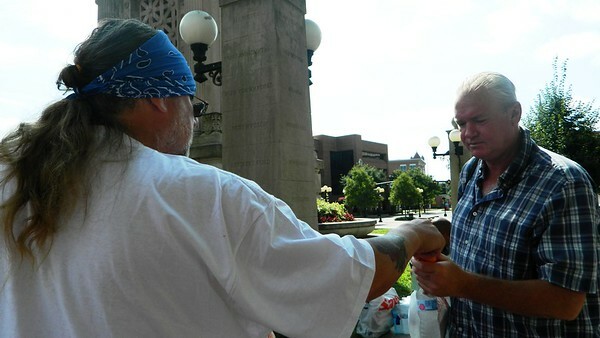 After the preaching, he helps them hand out sandwiches, fruit, water and granola bars. They also gave out tents, sleeping bags, and foam mats to people who expressed needing them. “I feel so blessed,” one woman said, hugging her new sleeping arrangements, wiping a tear from her eye. Another woman, Kathleen Depp, said she has known the Barans for quite awhile. They visited her when she entered rehab and sent their generosity when she was in prison. Tom and Donna began their ministry in Bristol 6 1/2 years ago, handing out food and toiletries in the parking lot at the intersection of School and West streets. This distribution continues every Saturday from 3 to 4 p.m. Over 100 people usually stop by. 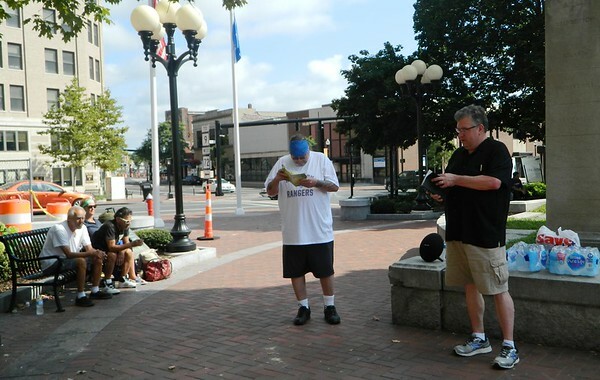 It spread to New Britain in July 2016, where it continues Sunday mornings in rain, snow or sunshine. 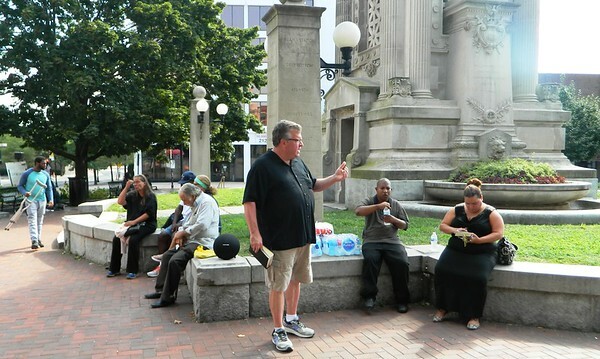 Sometimes up to 50 people come to hear the Christian message and get something to eat. Reminding the lonesome and lost they encounter in daily life that that there is someone who cares about them drives the Barans’ mission. It’s not about straightening out lives, forcing change or imposing religion. Those who take part know this, and that’s what keeps them coming back. Many suffer from mental illness, addiction or other problems. Some don’t have relationships with their own families. The transient lifestyle has also made it difficult to count on friendships. The church service filters a little light into the darkness shrouding these worlds. No matter what they’ve done, people are always welcomed. Money is never exchanged. The Barans will however, buy you a bus ticket, a breakfast sandwich, sneakers, a tent. Both work full-time jobs during the week to support their ministry, which never ends. Any given day could hold a visit to a hospital, where someone is recovering from an overdose or a street fight. Sometimes they meet people for coffee, picking up the bill. The vast majority of the ministry comes out of the Barans’ own pockets, though a Southington-based knitting group donates socks, hats and gloves for when the snow starts to fall. Posted in New Britain Herald, New Britain, Southington Herald on Sunday, 2 September 2018 20:59. Updated: Sunday, 2 September 2018 21:02.